58 teams paid respect to the late Beat the Heat crew chief, John Sorensen on Friday night at Hidden Valley Drag Strip as part of the Hogs Breath Cafe John Sorensen Memorial. The Hogs Breath Mini Eliminator provided some action packed racing with competitors vying for the Sorensen Memorial Trophy. It was an all Holden affair for the finals with Bob Czernaiwski in a Holden VX SS Commodore taking on Shaun Boyer in a Holden Gemini. Czernaiwski ran a 13.732 on a 13.70 second dialin to defeat Boyer. Shane Munt finished third after defeating Mitchell Doyle. In the bikes Leith Darrach defeated Stewart Campbell’s Yamaha R6 by the narrowest of margins. Darrach’s 0.2sec faster reaction allowed him to carry the lead through to the finish where he ended with a 12.083 on a 12.0 second dialin. Josh Schuit was too good for Buell rider Terry Palmer and took out third place. The fastest reaction of the night in a car went to Keelan Peck in the Pecky's Performance centre Ford XR6 Turbo with a 0.414 second reaction, while Brandt McGlade managed a 0.425 second reaction on his 2009 Harley Davidson, both riders scoring AFD fuel vouchers for their efforts. Several new competitors visited the strip for the first time, including Daniel Foreman and Scott Munro both from Queensland. Munro debuted his Mazda RX5 powered by a 20B turbocharged rotary. "That rotary will be incredible once he (Munro) gets it sorted" said volunteer official Joe Collocott. "Standing on the start line right next to it, you really feel the heat coming out of its (side facing) exhaust". The Perfect Reaction Challenge remained unclaimed for 2010 with no one able to achieve a perfect 0.400 second reaction. The Farewell Special is scheduled on Saturday 3 July and will see the return of all competition classes including everything from road registered street cars and bikes all the way up to the fast paced Outlaws. National competitor, Scott McLean is also rumoured to be returning from his racing on the national ANDRA Pro Series circuit and may be using the night for further testing in his 5 second Top Doorslammer. Gates will open from 2pm with qualifying underway from 3pm before feature racing kicks off at 7pm. 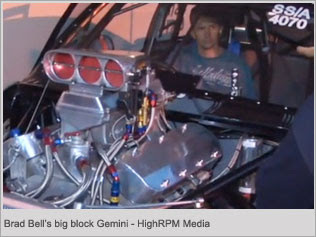 HighRPM "Beat the Heat" Off Street Drag Racing May 14th 2010 from rx2re on Vimeo.